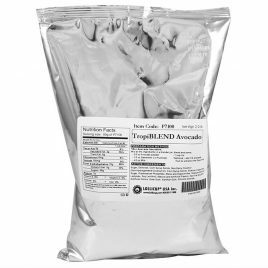 Tea Zone TropiBLEND Avocado Powder is a powder mix great for making smoothies, milk teas, flavored milk, and various blended drinks. With many natural flavors to select from, Tea Zone TropiBlend powders are securely sealed and designed to be resealable after opening to maintain the quality of the powder. To ensure uncompromised and sanitary usage, powders should be store in a vacuum sealed power container and always use a dry, clean powder scoop. Packaging design may differ from product photo. 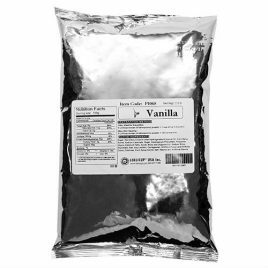 Tea Zone Banana Powder is a premium powder mix great for making smoothies, milk teas, flavored milk, and various blended drinks. With many natural flavors to select from, Tea Zone premium powders are securely sealed and designed to be resealable after opening to maintain the quality of the powder. To ensure uncompromised and sanitary usage, powders should be store in a vacuum sealed power container and always use a dry, clean powder scoop. 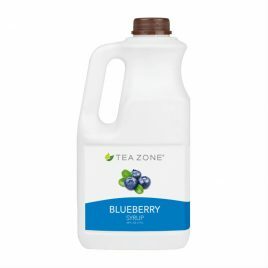 Made from real fruit ingredients, Tea Zone Blueberry Syrup is perfect for making refreshing slushes, smoothies, juices, flavored teas, frozen yogurt, shaved ice, and even alcoholic cocktails. Tea Zone syrup bottles can be equipped with a pump dispenser to minimize product waste, reduce dripping, increase dispensing accuracy, save space, and allow for easy clean up. Made from real fruit ingredients, Tea Zone Kiwi Syrup is perfect for making slushes, smoothies, juices, flavored teas, frozen yogurt, shaved ice, and even alcoholic cocktails. Tea Zone syrup bottles can be equipped with a pump dispenser to minimize product waste, reduce dripping, increase dispensing accuracy, save space, and allow for easy clean up. Packagingdesign may differ from product photo. 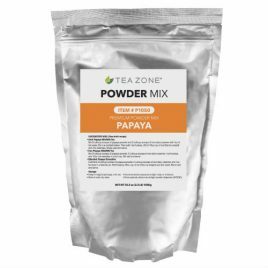 Tea Zone Papaya Powder is a premium powder mix great for making smoothies, milk teas, flavored milk, and various blended drinks. With many natural flavors to select from, Tea Zone premium powders are securely sealed and designed to be resealable after opening to maintain the quality of the powder. To ensure uncompromised and sanitary usage, powders should be store in a vacuum sealed power container and always use a dry, clean powder scoop. Packaging design may differ from product photo. 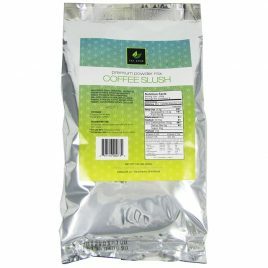 Tea Zone Classic Coffee Mix?is a premium instant powder mix to make coffee slush. 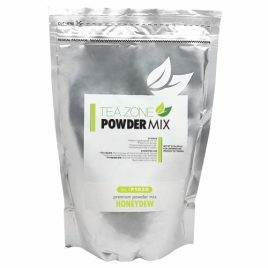 Tea Zone powders are securely sealed and designed to be resealable after opening to maintain the quality of the powder. To ensure uncompromised and sanitary usage, powders should be store in a vacuum sealed power container and always use a dry, clean powder scoop. Tea Zone Coconut Powder?is an original premium powder mix great for making smoothies, milk teas, flavored milk, and various blended drinks. With many natural flavors to select from, Tea Zone premium powders are securely sealed and designed to be resealable after opening to maintain the quality of the powder. To ensure uncompromised and sanitary usage, powders should be store in a vacuum sealed power container and always use a dry, clean powder scoop. Tea Zone Honeydew Powder?is an original premium powder mix great for making smoothies, milk teas, flavored milk, and various blended drinks. With many natural flavors to select from, Tea Zone premium powders are securely sealed and designed to be resealable after opening to maintain the quality of the powder. To ensure uncompromised and sanitary usage, powders should be store in a vacuum sealed power container and always use a dry, clean powder scoop. Tea Zone Mango Powder?is a premium powder mix great for making smoothies, milk teas, flavored milk, and various blended drinks. With many natural flavors to select from, Tea Zone premium powders are securely sealed and designed to be resealable after opening to maintain the quality of the powder. To ensure uncompromised and sanitary usage, powders should be store in a vacuum sealed power container and always use a dry, clean powder scoop. Tea Zone Matcha Green Tea Powder?is a premium powder mix great for making smoothies, milk teas, flavored milk, and various blended drinks. With many natural flavors to select from, Tea Zone premium powders are securely sealed and designed to be resealable after opening to maintain the quality of the powder. To ensure uncompromised and sanitary usage, powders should be store in a vacuum sealed power container and always use a dry, clean powder scoop. 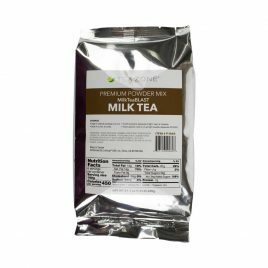 Tea Zone Strawberry Powder?is a premium powder mix great for making smoothies, milk teas, flavored milk, and various blended drinks. With many natural flavors to select from, Tea Zone premium powders are securely sealed and designed to be resealable after opening to maintain the quality of the powder. To ensure uncompromised and sanitary usage, powders should be store in a vacuum sealed power container and always use a dry, clean powder scoop. 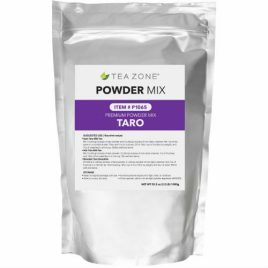 Tea Zone Taro Powder?is a premium powder mix great for making smoothies, milk teas, flavored milk, and various blended drinks. With many natural flavors to select from, Tea Zone premium powders are securely sealed and designed to be resealable after opening to maintain the quality of the powder. To ensure uncompromised and sanitary usage, powders should be store in a vacuum sealed power container and always use a dry, clean powder scoop. Tea Zone Watermelon Powder?is a premium powder mix great for making smoothies, milk teas, flavored milk, and various blended drinks. With many natural flavors to select from, Tea Zone premium powders are securely sealed and designed to be resealable after opening to maintain the quality of the powder. To ensure uncompromised and sanitary usage, powders should be store in a vacuum sealed power container and always use a dry, clean powder scoop. 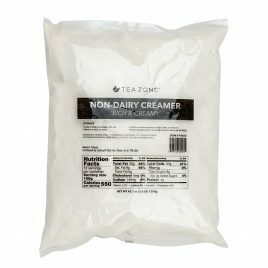 Tea Zone Non-Dairy Creamer "Rich & Creamy"?is our original premium powder creamer used as a base for smoothies and milk teas. Tea Zone premium powders are securely sealed and designed to be resealable after opening to maintain the quality of the powder. To ensure uncompromised and sanitary usage, powders should be store in a vacuum sealed power container and always use a dry, clean powder scoop.